Pictured front row from left: Paige Wallace, Lakyn Phillips, Hannah Lynch, Kailey Filben, Sarah Fitzpatrick and Leah Reuschel. Back row from left: Dakota Wyatt, Creed Kidney, Brayden Snider, Madi Blake, Ben Games, Eli Nielson, Cameron McClure and Olivia Miller. 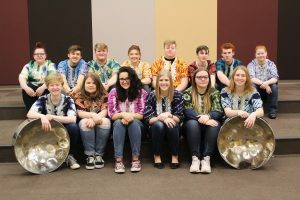 The John Marshall Steel Drum Band, under the direction of Tracey Filben, submitted recordings last spring to the Midwest Clinic, International Band and Orchestra Conference. The ensemble was contacted in May and has been invited to perform in Chicago, Illinois at the upcoming conference. This is the first group to ever represent West Virginia at this prestigious, international conference. The band has completed several fundraisers in order to cover the costs for this exciting trip. The 14 members and Filben will depart for the “Windy City” on Tuesday, December 18 and return Friday, December 21, 2018. In addition to performing three times during the conference, the student musicians will have a chance to see the most up-to-date music styles and education techniques. The Midwest Clinic International Band, Orchestra and Music Conference each year displays top ensembles throughout the music conference to showcase the newest ideas and talent. For more than 70 years, musicians, educators and people passionate about music education of all skill levels have gathered in Chi-Town for the largest music conference of its kind. This annual clinic is held every December. The John Marshall Steel Band was formed in 2008, thanks to a donation from the Niekamp Foundation. The group became a part of the instrumental curriculum at John Marshall several years later. Previous honors for the steel band include: WV Arts Alive 2015, West Virginia Music Educators Association (WVMEA) X-Ensemble Finalist 2016, WVMEA X-Ensemble Finalist 2018. The group has also performed in multiple steel drum festivals and public performances.